Our goal is to provide weekly collection of solid waste to all single family, duplex, triples and quadplex units on public roadways. Collection occurs weekly except where, due to a holiday or unforeseen circumstances, it is necessary to delay collection by one day. In no case will collection occur on Sunday unless the Township Supervisor has given approval in writing. Contact Residential Services: (734) 484-0073 for missed trash pick-up, questions, or concerns. All items that are acceptable for pick-up according to these rules must be placed at curbside no earlier than 6:00pm on the day before collection and no later than 6:00am on the designated pick up day. Empty containers and/or rejected items must be removed by 6:00am on the day after collection. Collection is limited to three 32-gallon containers (metal or plastic) with handles weighing under 50 pounds each OR three plastic bags weighing 10 - 30 pounds each (or a combination of containers and bags to equal three) OR a Waste Management 96-Gallon Toter Cart and 1 bulk item per week; does not include white goods. Items over the limit will be tagged and left at the curb. To get additional trash containers and/or bags collected, tags and stickers must be purchased from Ypsilanti Township at the Tilden R. Stumbo Civic Center or Community Center and placed on each additional trash container and/or bag. Tags for additional containers or bags will be $2.00. Stickers for additional bulk items, white goods, and freon-related item stickers may be purchased with a credit/debit card by Contacting Waste Management: (866) 797-9018 in advance (Ypsilanti Township Offices do NOT sell bulk tags). Tags may not be duplicated/tampered with to fit two or more bags. White Goods: dishwasher, stove, washer, dryer, wall oven, water heater. Freon Goods:refrigerator or freezer with doors removed and placed next to the item at the curb, de-humidifier, air conditioner. NO lids chained or attached to sides of cans. NO overflowing containers or materials placed on top of lid; lid must be closed. Wood properly prepared; May not exceed 4' in length, nails must be removed or pounded flat, tied in a bundle at both ends (use duct tape or twine) and not weighing more than 50 pounds per bundle. One bundle of wood is a bulk item. Carpet/Pad properly prepared; may not exceed 4' in length or 8" in diameter, tied in a bundle at both ends (use duct tape or twine) not weighing more than 40 pounds per bundle. One bundle of carpet is a bulk item. Paint Cans (Latex Only) properly prepared. Remove the paint can lid and place it in the trash. Fill paint cans to the rim with kitty litter, sawdust, or sand and stir until hardened; paint must be completely dried. Place cans on the ground next to your trash bags or cans. Unacceptable: Containers over 32-gallon size (with exception of the 96-gallon toter), fabricated containers, drums, cardboard boxes, gasoline, tires, automotive oil, car/truck parts, lead acid batteries, hazardous waste items (Washtenaw County Home Toxics Reduction Center), construction/roofing debris, fencing, railroad ties, large pieces of wood, drywall, yard waste, tree stumps, concrete, bricks, landscaping blocks, oil-based paints, beverage cans, landfill prohibited waste, refuse not capable of being loaded by the contractor into a packer-type truck. It is unlawful to burn any garbage, rubbish or yard waste whatsoever in Ypsilanti Township. Residents eligible for curbside service are required to place containers at curbside for collection. Curbside refers to that portion of a dedicated public right-of-way adjacent to paved or traveled roadways (including alleys). All items to be picked up under these rules must be placed alongside a public roadway. Waste Management and the Township will not pick-up from private roads. Containers shall be placed in a manner that will not interfere with or endanger the movement of vehicles or pedestrians. When construction work is being performed in the right-of-way, containers shall be placed as close as possible to an access point for the collection vehicle. The contractor shall not be required to pick-up any items that are more than 4' from the edge of the roadway. Removal of all items as set forth in these rules will be picked up only if they are properly separated and prepared. If material is not properly prepared for removal, Ypsilanti Township or its contracted agent, upon observing a violation of this chapter, may refuse to collect the material. It is then the responsibility of the resident to dispose of the material at his or her own expense within 24 hours. Failure to remove said items from the curb may result in the issuance of a citation per Ypsilanti Township ordinances. 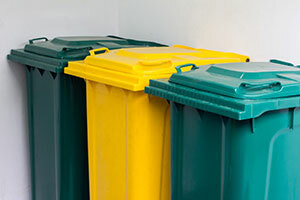 Exceptions and variances to the above collection and removal rules are available for residents who are physically incapable to place recyclables, yard waste, or trash at curbside and if no other resident of the same household is capable of carrying these items to the curbside for pick-up. The Township Supervisor or the Environmental Services Director, upon written request, with a physician note may authorize an exception or variance in cases of extreme hardship of practical difficulties. In these instances, special arrangements will be made by Ypsilanti Township or its contracted agent to have collection personnel collect materials.